More photos: of entire ship, of details. Click on the photos for high resolution pictures! The Russian frigate PALLADA (in Russian Паллада) was built in 1833 to the prototype of an American frigate, the USS President. The ship was one of the best ships of the Russian Navy and was thus chosen for taking the Russian consulate to Japan in 1853. Admiral Yevfimy Putyatin led the Russian expedition which went via England and Africa to Japan. In 1855 a commercial treaty between Russia and Japan was signed. This journey got well known by the account of the writer Ivan Goncharov, who wrote a travelogue, "The Frigate Pallada", published in 1858. When the Crimean war started 1854, the ship was sent up the Amur river out of harm's way when the Russians tried to defend the harbour of Petropavlovsk on the Kamchatka peninsula. In 1855 when the English once again attacked the PALLADA was sunk by her own crew to prevent the English ships getting inside the Amur delta. The model was built to plans of A. Larionov gebaut, journal Modelist Konstruktor Nr. 6 - 8/1980. The ship model was built with sails tightly furled to the yards, to allow for a better view on the very detailed, impressive rigging. The main yard is braced up and prepared to lift the boats and let them down to the water. 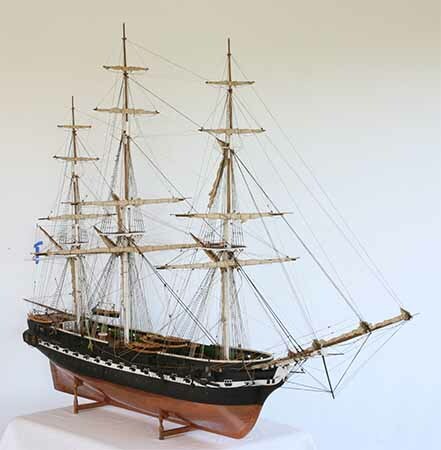 This model of the frigate PALLADA is a very beautiful true masterpiece, with many details shown in hull and rigging. It was built by a very experienced modeler. The ship model is 1 : 50 scale. Length is 189 cm, width 55 cm, height 128 cm. Please take your time to have a good look at the set of photos. There are several views of the entire ship model taken from all directions, and several closer views of hull, deck and rigging. Click images to enlarge! This model has already been sold. The pictures and the data are shown in the gallery of the ship models sold only to let enthusiasts and model makers enjoy the photos and maybe get ideas or some guidance, if someone builds such a model by himself.